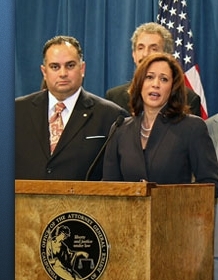 Attorney General Kamala D. Harris at a February news conference on the mortgage crisis in California. James A. Sweeney II and Patrick M. Ryan — the two men who presided over the Big Co-op Inc. and Ez2Win.biz online pyramid scheme and stock swindle — have been sentenced to a combined 64 years in state prison, California Attorney General Kamala D. Harris announced. Sweeney, 64, of Afton, Tenn., was sentenced to 33 years. Ryan, 35, of Canyon Lake, Calif., received a sentence of 31 years. Big Co-op and its Ez2Win arm purported to be an online shopping hub where consumers could go to purchase goods and services at discounted prices from big-name retailers including, Sears, Target and Macy’s. Operating as a pyramid scheme and recruitment trap from 2005 to 2006, Big Co-op plucked $1.2 million, prosecutors said. A phony stock offering also was part of the mix, and the fraud soared by about $7 million. The combined scams were fueled by seminars and netted $8.2 million, prosecutors said. More than 1,000 Californians were lured into the schemes. Filings by the California Department of Corporations painted a picture of affiliates making wild claims to drive business to the purported opportunities.